The present research has no competing interests and was funded by Cardiff Business School, Cardiff University. Ethical approval was obtained from the School’s Ethics Committee. Action on Smoking and Health (ASH). (2012). Smoking statistics: Who smokes and how. Accessed February 25, 2012, from http://ash.org.uk/files/documents/ASH_106.pdf. Australian Medical Association (AMA). (2001, January 1). Problem gambling. Accessed February 25, 2012, from http://ama.com.au/youthhealth/gambling. Australasian Gaming Council. (2008, November). Factsheet AGC FS 17/08. Accessed August 24, 2011, from http://www.austgamingcouncil.org.au/images/pdf/Fact_Sheets/agc_fs17whatispg.pdf. Cai, Y., Jo, H., & Pan, C. (2011). Doing well while doing bad? CSR in controversial industry sectors. 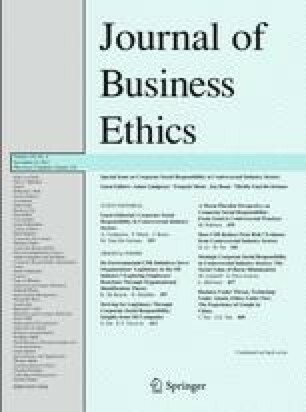 Journal of Business Research, published Online First: 9 November. doi: 10.1007/s10551-011-1103. Church of England. (2006, September 19). Church questions proposals for gambling advertisements. Accessed February 25, 2012, from http://www.churchofengland.org/media-centre/news/2006/09/pr9306.aspx. Department for Culture, Media and Sports. (2011, July 14). News releases 069/11. Accessed November 3, 2011, from http://www.Culture.gov.uk/news/media_releases/8299.aspx. Drinkaware.co.uk. (2012). Binge drinking: The facts. Accessed February 25, 2012, from http://www.drinkaware.co.uk/facts/binge-drinking?gclid=CJaF6IiSlq8CFY8PfAodpi7IkA. European Gaming and Amusement Industry (Euromat). (2007, October 25). Statement on responsible gambling. Accessed August 24, 2011, from http://www.euromat.org/uploads/documents/EUROMAT_brochure_1_web.pdf. Gambling Commission. (2012). Licence conditions and codes of practice. Accessed February 15, 2012, from http://www.gamblingcommission.gov.uk/publications_guidance__advic/lccp.aspx. Gamcare. (2007). Online Gambling. Accessed February 15, 2012, from http://www.gamcaretradeservices.com/pages/about_us.htmlhttp. Gambling News. (2011, January 31). Changes for online gambling in the UK. Accessed August 24, 2011, from http://www.durocher.org/gambling-news/changes-online-gambling-uk. H2 Gambling Capital: 2011, E-Gaming Report, July 8, 2011, http://www.h2gc.com/news.php?article=Post+Q2%2FFullTilt+Closure+H2+eGaming+Dataset+Now+Available, accessed 28 October, 2011. Gambling Research Australia (GRA). (2008). A review of australian gambling research, Chap. 4: The characteristics of EGMs and their role in gambling and problem gambling. Accessed February 28, 2012, from http://www.gamblingresearch.org.au/CA256902000FE154/Lookup/AnalysisAustGamblingResearch/$file/Chapter%204.pdf. KPMG International. (2010, April 1). Online gambling, a gamble or a sure bet? Accessed October 28, 2011, from http://www.kpmg.com/global/en/issuesandinsights/articlespublications/pages/online-gaming-a-gamble-or-a-sure-bet.aspx. Remote Gambling Association (RGA). (2010). Market size, fact sheets, http://www.rga.eu.com/data/files/resources/fact_sheet__market_size__draft_103_3.pdf. Scuffman, M., & Davey, J. (2011, October 27). Stay-at-home britons turn to TV, online gambling. Accessed November 3, 2011, from http://www.reuters.com/assets/print?aid=USLNE79Q03U20111027.